As a new player, it can be a tricky proposition to find everything you need to hit the field and make sure you don't overspend. But fear not because Airsoft GI has your six! We've put together what we believe is one of the best possible package deals you can find to start playing on the field! This package includes the Lancer Tactical Gen 2 SOPMOD M4 RIS Carbine AEG (in black) with a 9.6v NiMH battery and charger, which is the ultimate option for lightweight airsoft combat. Its polymer body makes it durable and rugged, yet lightweight and easy to maneuver while its high quality internal parts will keep you on target and scoring hits with ease! The included battery and charger make sure that this airsoft gun is ready to go out of the box. 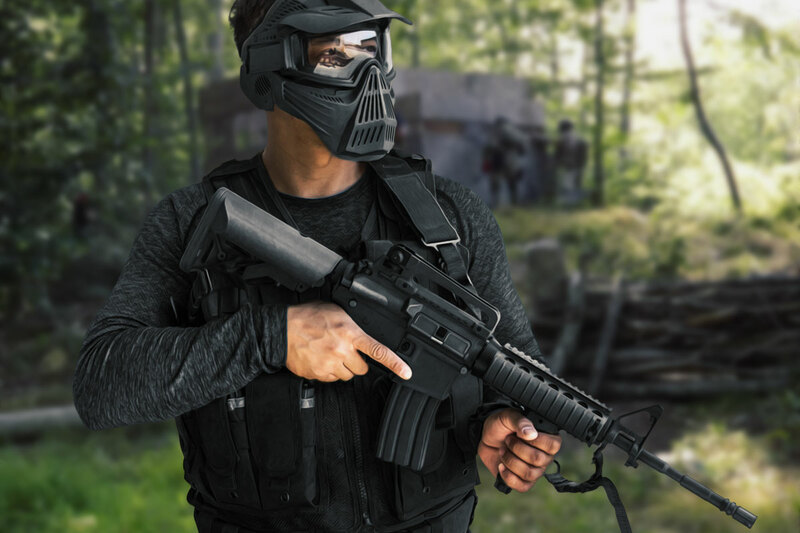 To protect your eyes and face, we've included the Classic Army Full Face Mask (also in black) making sure you have adequate protection for almost every airsoft field. We're also including two extra, 300 round high cap magazines and four 2,500-count bottles of BBs to fill them with! Now you'll need somewhere to keep all these goodies and for that we've secured you a Classic Army Tactical Cross Draw Vest (in Black) to make sure you can carry everything in this package onto the field. This package saves you $69.93 on an already low retail price. It's an unbeatable value to get you on the field and playing. With the equipment in this bundle, you'll have everything you need to not only hit the field and play, but actually be competitive with more advanced players. These items were handpicked for their budget-friendliness and high performance. Every part and accessory comes from a leading brand in the airsoft field and has been shown to be effective on the playing field, too. The rifle alone is easily capable of going toe-to-toe with most other AEGs on the market, and has proven durability. 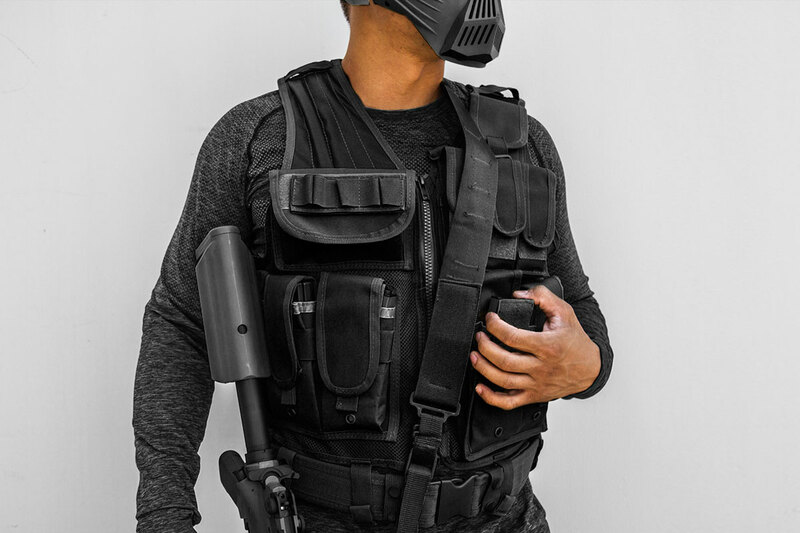 When you add in the face mask, magazines, tactical vest and other airsoft starter equipment, you're talking about being prepared for even the toughest matches. Don't engage targets you can't hit. This rifle is at its best in the 100-200 feet range. Make sure your batteries are charged before the game. Consider picking up a few spares as well to keep you on the field even longer. The average battery lasts for about three to four high capacity magazines. Choose wisely. Wind your hi-cap magazines before the game starts as well. Nothing is worse than trying to take a critical shot and your gun misfiring while trying to take a critical shot because you forgot to wind your magazine. Long sleeves, tactical pants (or cargo pants of any kind) and a good pair of boots with ankle support are going to make you much more comfortable. Water is an absolute necessity. You can keep a small bottle in an empty magazine pouch, or pick up a more dedicated pouch to attach to your vest via the MOLLE webbing. If you get shot, call your hits! It's only a game. The walk back to respawn is a good time to collect some information on how the rest of the field is changing so you can get the drop on your targets when you get back in the game. 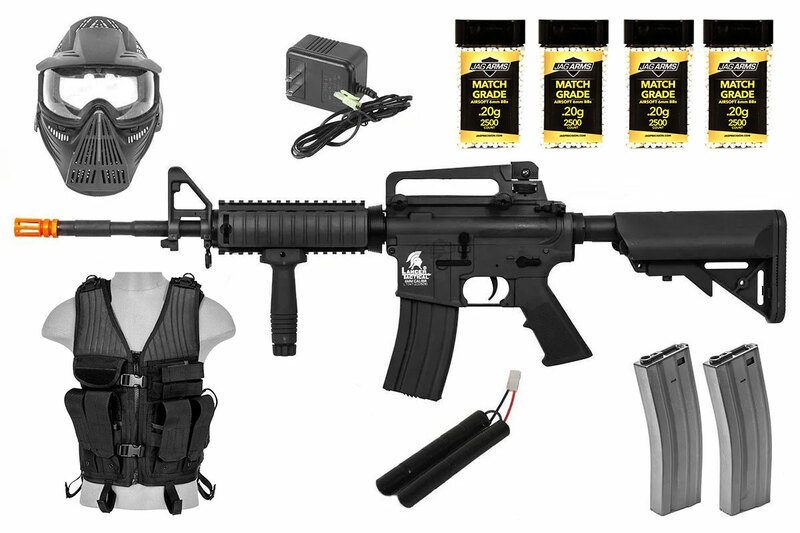 Pull the trigger (pun intended) and pick up the Best Airsoft Gun Starter package today, and we'll see you on the field! This package was the perfect item for our buddies birthday. A bunch of us pitched in and got him this package when it was first released it looked like it had everything he needed to start going out with us to play airsoft. Gun it self-comes with a battery and charger and the package has everything else needed, Extra BBÂ’s, sling, magazine, vest, and a mask for $200 bucks. So far he has played a few games with us and is loving the hobby. I would recommend this package if you are not sure what to get for a beginning airsofter. We pitched in for an additional battery which is about the only thing the package is missing. The battery will last about 1500 shots, so you might want to consider a second battery if you are heavy on the trigger. I have reasonably normal sized glasses and am blind without them, will they fit under? Yes, as long as the frames aren't too bulky. Why doesnâ€™t the gun shoot? We load the magazine with bbs and put the magazine into the gun. Then we fire it a few times then no bbs come out. We take the magazine out and 3-4 bbs fall out. What is wrong? You need to wind the magazine several times. 3-4 bbs falling out is normal, as those are the BBs stuck inside the hop up chamber. It should get fairly tough to wind once it's near max winding limits. Looking To Bring this gun to A Field But The FPS Is a little over The Arena Says 350FPS But The Gun I just bought is 350-395 Will I still be ok or No? Sounds like you'll need to get a lower tension spring in there to play at your field. 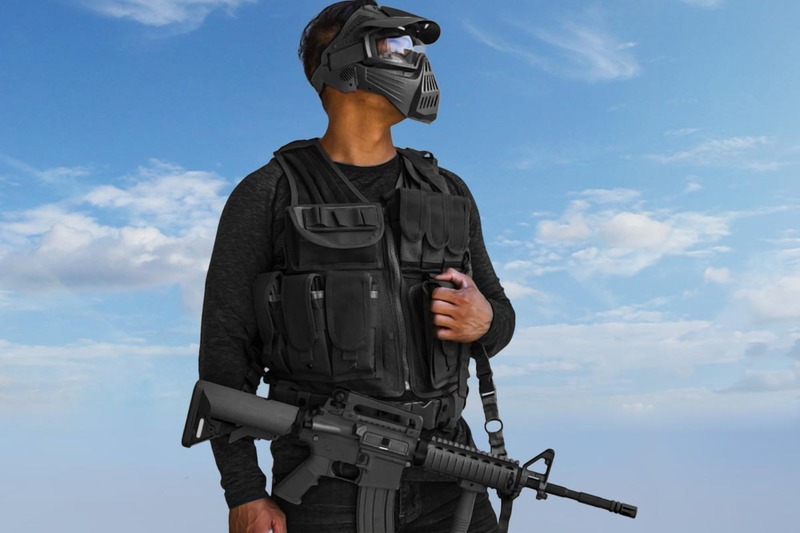 I'd recommend the <a href=" https://www.airsoftgi.com/product/Airsoft-GI-CQB-Indoor-Package-1056/?cPath=745_67_68 "target=blankï¿½> <font color=blue> Airsoft GI CQB/Indoor Package</font></a>. Can this be shipped to canada with no legal problems? Where would a scope go? Would a scope replace the iron sights or would it go somewhere else? An optic would either go on top of the carry handle via a mount, or on the rail underneath the carry handle once removed. Does the gun have a scope rail on the top of it? yes, a scope can be put on this, as long as you have scope rings as well. It does not come with scope mounts.